Sinusitis one of the most common issues people tend to experience in the US and as well as worldwide. However, it’s still an incredibly unique health problem, and this is because the term covers numerous causes. 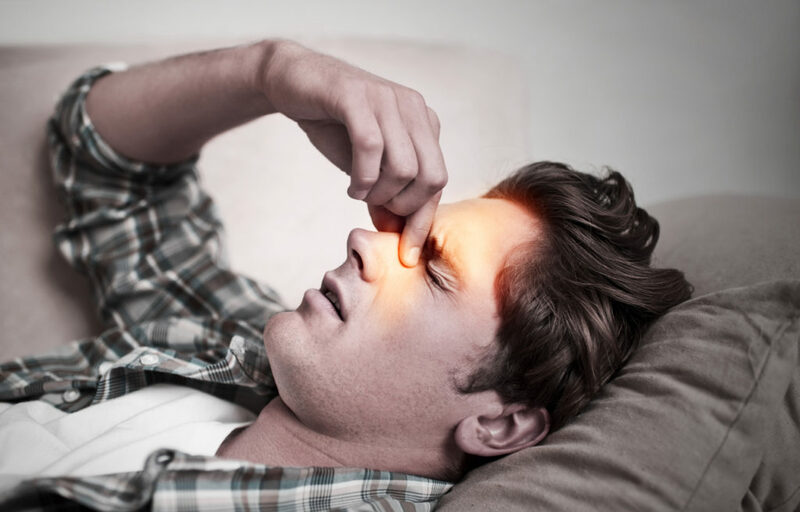 Since the word ‘sinusitis’ encompasses any inflammation of the sinus lining, the many causes of the problem make the issue unique from one person to the next. Patients often have the same symptoms as well as habits and lifestyle choices that exacerbate the symptoms of sinusitis. For example, smoking can be extremely damaging to sinus linings – nicotine smoke entering the nasal passages will undo all of your doctor’s good work and will cause even more inflammation. Furthermore, there has also been a link between obesity and sinusitis in recent years too. Regarding science, there hasn’t been too much in the way of linking the two as causes but one exacerbates the other, and it ends up in a negative spiral of events. How Are Obesity and Sinusitis Connected? With sinusitis, we know that the symptoms include pressure in the sinuses as well as a sore throat and cough. Unfortunately, excess weight around the neck will put more pressure on the throat and the sinuses. When trying to sleep especially, the airways are restricted which leads to more coughing, less sleep, and so on. If not treated correctly, those who are overweight can have a terrible time with sinusitis. Even with the healthiest people on the planet, a lack of sleep leads to increased hunger the next day. Thanks to extensive research at the Center for Sleep and Human Performance, we know that cutting sleep short affects our appetites. Two main hormones affect our appetites: ghrelin and leptin. While ghrelin is responsible for making us hungry, leptin suppresses hunger. If we sleep for just four hours, the levels of leptin reduce while the ghrelin levels increase, leading to increased hunger the next day. Since we know sinusitis can interfere with your sleep quality, overeating can cause weight gain, and obesity contributes to the lack of sleep due to the restricted airways, this cycle repeats itself every single day. When somebody suffers from these two issues, it can be devastating if not managed effectively and this is why professional assistance is so critical. Eating the right foods – high-fiber and low sugar foods such as dark leafy greens, nuts, and fish – can greatly improve the adverse side effects of both sinusitis and obesity. Sadly, the Western diet is somewhat disappointing, and it seems to have gotten worse over the years. Nowadays, we eat foods that are high in fat, high in sugar, and low in fiber which all contribute to weight gain. If we couple this with a sedentary lifestyle, far more calories are consumed than burned, leading to excessive amounts of fat storage. For sinusitis patients, it’s also bad news because our eating habits can impact inflammation, which is why doctors often worry about those who are a little overweight. For example, processed sugar can be found everywhere in supermarkets now, whether it’s chocolate bars or desserts (and even sodas). With processed sugars high in glycemic load, our insulin levels increase, and blood glucose levels decrease. Over time, this encourages inflammation and worsens the symptoms of sinusitis. Foods that contain significant amounts of saturated fats (these are common in our diets these days, just like processed sugars) can trigger inflammation within the tissues and muscles in the neck and nasal passage (as well as everywhere else in the body). Finally, refined carbohydrates will cause a quick boost to the blood sugar levels which requires the pancreas to produce insulin. Once the pancreas loses control and can’t quite provide enough insulin to make a difference, sinus inflammation worsens and risk of diabetes increases. Unfortunately, the biggest issue with obesity and sinusitis is that the adverse effects often come around for a second, third, and fourth bite; this causes a vicious cycle. If you are obese, you’ll need to be aware of your sinuses and take note of any symptoms of sinusitis you experience. If you have sinusitis, we urge you to eat healthily. The right foods will fight inflammation rather than encourage it, including nuts, fatty fish, some fruits, green leafy vegetables, and more! ‹ Are Sinus Infections Contagious?